Police forces across England and Wales recorded a 3.9% year-on-year increase in the number of motorists caught drink or drug driving in December 2017 – despite administering fewer tests. Under the National Police Chief’s Council festive campaign, forces used an ‘intelligence-led approach’, targeting areas where drink and drug driving is ‘more commonplace’. A total of 91,466 tests were administered across December 2017 (down 3.6% from 94,940 in 2016) – with 5,922 returning positive, refused or failed (up 3.9% from 5,698). The figures mean the percentage of positive tests rose from 6% in 2016, to 6.5% in 2017. The NPCC attributes the increase to the use of ‘intelligence led, targeted stops’. 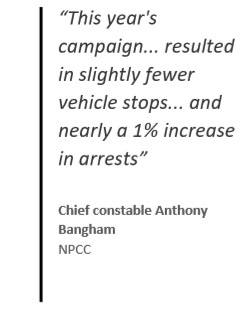 The NPCC figures also show a higher rate of positive tests following a collision. Of the 17,138 tests administered in these circumstances, 9.2% (1,575) were positive. Drivers under the age of 25 years also recorded a higher than average fail rate – with 8.1% of the 15,439 test administered (1,250) to this age group proving positive. With regard to drug driving, 3,885 drug screening devices were administered, with 1,678 (43.2%) returning positive. Chief constable Anthony Bangham, National Police Chiefs’ Council lead for roads policing, said: “Drink and drug driving affects every part of the country so it was really important that all 44 police forces took part in this operational activity. “This is part of our commitment to enforcing the law which says that if you drive while under the influence of alcohol or drugs you can have an unlimited fine, disqualification from driving, and more than a decade in prison. “This year’s campaign used more intelligence led, targeted stops which resulted in slightly fewer vehicle stops than Christmas 2016 and nearly a 1% increase in arrests. Figures published by police forces in Wales earlier in January show that 438 arrests for drink or drug driving were made in December 2017 – down on the 2016 festive campaign, when 478 drivers either tested positive, refused or failed a drink drive test, and 151 tested positive for drugs. Charles, the innocent have nothing to fear! Are we congratulating or condemning the police for using this blunderbuss approach which resulted in 93.5% of their their alcohol tests hitting innocent motorists?